AUSTIN, Texas, April 16, 2019 /PRNewswire/ -- EverlyWell, a digital health company, today announced $50 million in financing led by long-time investors Goodwater Capital with Highland Capital Partners joining. Next Coast Ventures, NextGen Venture Partners, SoGal Ventures and others participated. The company will use the funding to expand its digital platform and scale existing partnerships with leading brands like CVS and Humana. EverlyWell's mission is to provide everyone access to transparent and insightful lab tests. Over seven billion lab tests are run annually in the United States, and lab testing is used in 70 percent of medical diagnoses. However, the traditional lab testing process is cumbersome, costly and confusing. 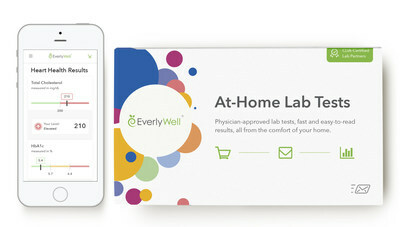 EverlyWell's digital platform connects consumers with existing, independent, certified labs for at-home collection tests that are ordered and reviewed by board-certified physicians. Once the sample is submitted, online results with evidence-based insights, suggestions and next steps are provided to consumers within days. "We're building the definitive technology-enabled healthcare platform that consumers deserve and have already come to expect in other areas of their lives. EverlyWell customers tell us daily that we've changed their lives by providing healthcare services they otherwise wouldn't be able to afford, access or understand. Americans borrowed a staggering $88 billion to pay for healthcare last year, and 65 million people avoided treatment due to cost. As high-deductible plans become the norm, consumers are becoming discerning buyers who look for seamless, digitally-enabled experiences," said Julia Cheek, founder and CEO. Just two full years into operation, EverlyWell is reporting 300 percent year-over-year customer growth and a world-class consumer Net Promoter Score (NPS). The company has also expanded its product line to offer 35 panels, including first-to-market tests in fertility, vitamins, peri- and post-menopause, and high-risk HPV. In addition, EverlyWell has launched an end-to-end care model for consumers, now offering an independent physician consult and prescription, if appropriate, for select STDs and Lyme Disease testing. All of this is included in an upfront price before purchase. In the last year, founder and CEO Julia Cheek has also hired key executives, including former uShip Chief Technology Officer Nick Parker, former Pinterest executive Jenifer Dasho as chief marketing officer, and Executive Medical Director Dr. Marra Francis. As part of today's announcement, the company has appointed Dr. Robert Langer as the head of its Scientific Advisory Board. Dr. Langer is one of only four individuals receiving both the National Medal of Science and the United States National Medal of Technology and Innovation. "Lab testing is arguably one of the most important steps in preventing and managing illness, but has been largely ignored by digital health companies," said Eric Kim, managing partner at Goodwater Capital. "With a clear consumer pain point and a strong executive team that integrates both consumer and healthcare expertise, EverlyWell is successfully navigating an entrenched industry to offer consumers an opportunity to take charge of their own health." EverlyWell believes consumers deserve access to affordable lab tests and insightful, digitally-enabled results with actionable next steps. The company connects consumers to lab partners offering a suite of validated lab tests including Food Sensitivity, Fertility and Women's Hormones, STDs, and Thyroid. Prices are straightforward starting at $49 and are generally covered by Flexible Spending and Health Savings Accounts. Physician-reviewed, actionable test results from CLIA-certified labs are provided within days of sample receipt. The company was founded in 2015, is located in Austin, TX and backed by notable investors including Goodwater Capital, Highland Capital Partners, Next Coast Ventures, NextGen Venture Partners, among others. EverlyWell was selected as one of Fast Company's Most Innovative Companies in 2019. For more information please visit www.everlywell.com.